Synopsis: The Doctor, Dodo, and Steven arrive on an ark which is taking the human population from a doomed Earth to a new planet. The guardians who are awake for this journey catch a cold from Dodo, and thus put The Doctor and his companions on trial. After less than a minute, we learn that our monster of the week is Brian Jones! 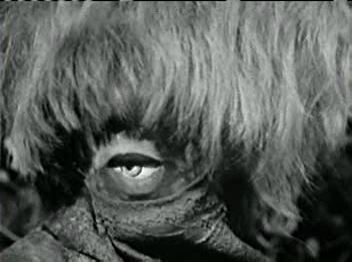 Turns out they’re the Monoids, and they’re essentially slaves for the human population, but they imply that the Monoids are slaves voluntarily. Yeah, uh ha. The legal minds who wrote this script must have a great experience in the court room. No evidence, no anything except conjecture. Eventually The Doctor cures the illness and they respect them finally. They leave in the TARDIS only to return hundreds of years later. In this future, the Monoids are the masters, and the humans the slaves. The Monoids grow tired of The Doctor and orders “Take them away to the security kitchen!” I wonder what a security kitchen is. Turns out it’s just a kitchen where the slaves cook for the Monoids. I remembered this story being better. The dramatic suspense is horrible, the story is not all that interesting. They have a great opportunity to discuss a subjugated peoples gaining power and systematically oppressing their former oppressors, but they don’t. Serial 024, The Celestial Toymaker, is missing.